The 50 Years-old Birthday Cruise departs November 2, 2019, from Miami. Royal Caribbean International has announced plans to celebrate its mid-century mark next year, aboard Symphony of the Seas. A “Save the Date” notice spotted on board a Royal sailing in the last week urged passengers to check with their NextCruise Sales Team for details. What we know so far is that the "50 Years Bold Birthday Cruise" sets sail on November 2, 2019, from Miami. The line describes the event as the "biggest, boldest birthday party ever.” The seven-night Eastern Caribbean cruise will stop at Royal Caribbean’s private island in the Bahamas, Coco Cay. The island is in the midst of rolling out Perfect Day at Coco Cay and other renovations. The birthday cruise will also feature “special events and surprise performers,” with more details no doubt to roll out later. Royal Caribbean actually celebrates its 50th anniversary this year. Its first ship was Song of Norway, which began sailing for the line in 1970. The line is now the world’s largest in terms of overall capacity. Over the years it’s continually raised the bar on vessel size. Ten of its 25 ships are among the biggest in the world. 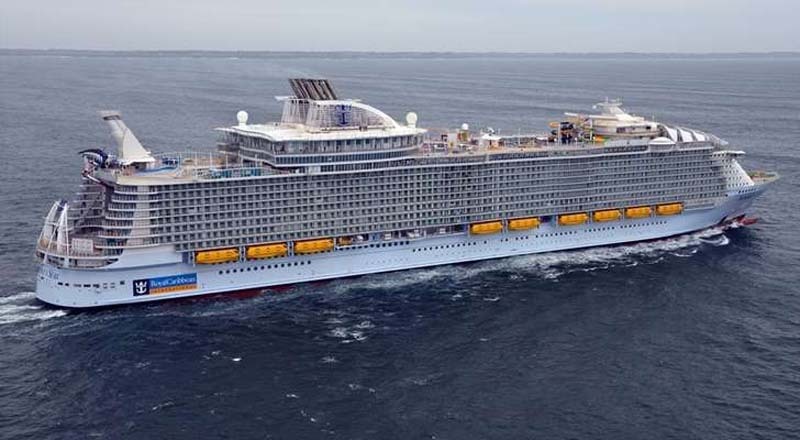 The latest and largest, Symphony of the Seas, debuted earlier this year. At 228,081 tons, she’s the largest cruise ship in the world. Among her many notable features are a two-deck-high family suite; a reimagined Boardwalk entertainment zone and a new laser tag attraction. She also carries over the popular features of Harmony of the Seas, built on the same platform.